Exercise your chest to build a fully chest making your breast appear bigger with workouts for women. Eat your way into bigger chest size secrets with soy. For women losing weight doesn't come without making sacrifices. You may have been able to drop the pounds you set out too, but suffered noticeable decrease in breast size making your breast appear smaller. The sad truth about weight loss is that losing weight doesn't help you protect your curves. What workouts for women can help me increase my breast size? When you are on a diet avoid taking shortcuts. Although losing 10 pounds per week is promising, you may have to give up on your chest to do that. Many women who have tried shortcut diet and exercise routines have the experience of losing weight only to be robbed in the chest. If you don't want to be one of these women continue reading. While dieting it's important to keep in mind the things you can do to keep your breast size from dropping with the weight your loss. Of course! How you do that is a balance between getting enough nutrients in your body refraining from harsh dietary restrictions. Not eating right doesn't help you maintain your breast size nor does it give you the energy to give your best in your training your chest. In this episode of Slism, we will discuss workouts for women to lose weight without losing your chest with chest exercises you can do while at home. Although there are people that think that your breast and your muscles are not related or should be treated entirely separately, however what supports your breast are the muscles in your chest. In particular, the muscle that keeps your chest from drooping is your pectoral muscle, i.e. your pecks. The building blocks when looking to maintain bust size is said to be to train your pectoral muscles doing chest exercises while eating healthy and getting enough sleep. So if you want to prevent saggy breast or want to maintain or even increase your bust size making your breast appear big you are going to have to take up chest exercise training your pectoral muscles building support around your chest. Get in a push up position on your knees with your fingers slightly curved inward toward the center of your body as if you were to put a cover on the space between your shoulders where your head is elevated above. Inhaling bring your upper body down towards the floor bending your elbows to the outside. Exhaling push your body away from the floor restoring to original position doing 3 sets of 10 repetitions getting started. For people who have trouble doing 10 push ups doing 5 instead is okay. Although doing press-ups helps train your arms, what you want to do is concentrate on working your chest to train your chest muscles. The wider you place your hands apart from your shoulders the better chest workout you get. In that respect the closer you bring your arms to your shoulder the less of a workout you get in your chest. That is why to get the best workout in your pectoral muscles it is favorable that you widen the space between your hands avoiding unnecessary bouncing. It is said that isoflavone is effective in helping you maintain or increase breast size. Found in isoflavone active ingredients that are said to have the same effect as the female hormone estrogen. Some have even gone so far to call it the natural estrogen. The female hormone estrogen gives your full breast and beautiful skin, just the stuff a woman needs to look more feminine. It turns out that following your period estrogen gets released in your body to restore immunity and set you back into balance. Isoflavonoids are said to prevent osteoporosis, slow down menopause, and even lower the chances of breast cancer giving a women all the tools they need to look young longer. Soy beans or any other soy products contain large amount of isoflavone to help you increase your bust size naturally. This includes soy sauce, soy milk, tofu, and bean curd left over after making tofu. That is why just by eating soy products it is possible to make your bust bigger without surgery. Soy beans are referred to be the meat of the fields in Japan. Not only are they nutritious giving you a complete balance of amino acids with an amino acid score of 100, they are said to be advantageous to people on a diet trying to lose weight. Saponin is said to delay absorption of fat and sugars by your body and lower the cholesterol level in your blood. Peptide can help your boost your metabolism and lower cholesterol, especially important for people with high cholesterol counts. Lower cholesterol and promote better liver function. Fatigue recover, break down of fat, boost fat metabolism, and treat dry skin. Shown to prevent anemia, help in fatigue recovery, and reduce the chills. Don't Overdose On Soy Isoflavone! Limit your daily intake of soy isoflavone to 70-75 mg a day. There is no problem consuming it naturally but be careful when taking supplements. Getting too much Isoflavonoids in your diet can upset your hormone balance and increases the risk of endometrial hyperplasia development in your uterus that may require estrogen replacement therapy to recover. Most people don't believe that building a strong chest can help you do more than push-ups. In fact you would be surprised what it does for your breast. 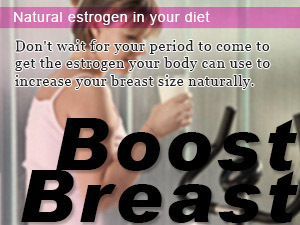 Don't wait for your period to come to get the estrogen your body can use to increase your breast size naturally. As attractive as it sounds there are no ways to instantly increase your breast size. Stop looking for shortcuts. If you want results only will tell.